There's something so quintessentially summer about blackberries. It brings back memories of August afternoons spent with my dad and brother – collecting as many berries as we could fit into our plastic ice-cream pails. We had our "secret" spot that we visited every year. It was a perfect slice of childhood heaven: a long, crooked trail littered with hundreds of unruly, brambly blackberry bushes on either side. This week I was feeling particularly nostalgic, so after work I dragged Anguel out to venture around the neighborhood on the hunt for some wild blackberries. We ended up stumbling on a big section of bushes tucked away from the main road, wedged between a house and a gravel trail. I must say, blackberry picking is so much easier now that I've grown about a foot or so taller. It almost felt unfair. By the end, our fingertips were stained a deep shade of purple and we'd each gathered a sizeable bowl of berries (his was just okay, to be honest). We headed home with big smiles on our faces…which I now realize were for very different reasons. I was excited to sink my face into the bowl of berries…and he was excited to get back to whatever important "stuff" he was doing before being dragged out on an impromptu berry mission. Blackberries are so juicy and delicious on their own - most of the time I prefer to just rinse and enjoy as is. But, once I'd had my fill of berries, I was itching to try something new with these handpicked gems. For such a simple fruit, I was struck by how hard I had to rack my brain to think of a way to cook these up. 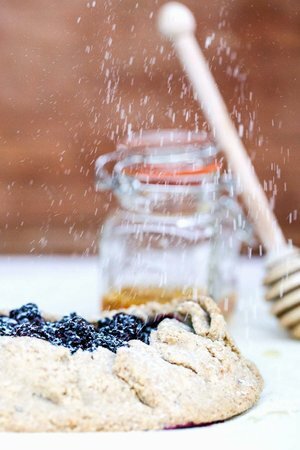 I got out a couple reliable partners in crime - oats and honey – and ended up making a simple, rustic tart. This tart shows off the fresh blackberries front and center, and then surrounds them with a simple, yet delicious pastry crust. There's a generous drizzle of raw honey over the tart to balance the natural tartness of the berries. Oh, and then I topped it with a scoop of vanilla ice-cream. It. was. so. good. Pie crust is notoriously unhealthy. But this one defies the odds. It isn't loaded with a stick (or two) of butter like a usual pie. Pastry crust does however require at least a bit of oil to keep everything together, so this recipe contains butter...just a lot less of it. And given it's lighter on oil, the crust itself is a lot less greasy, but slightly more crumbly – kind of reminiscent of a fruit crumble. Yum! This dish is great because you can get it popped into the oven fairly quickly, and then get back to enjoying the last bits of summer. 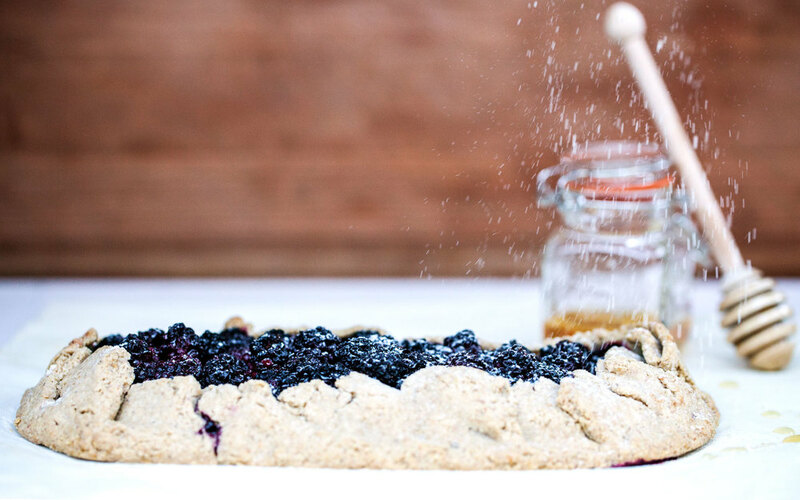 It only calls for 5 ingredients: oats, butter, salt, berries and honey. And, thanks to the oat base, this recipe is gluten-free! The end result is a beautiful, light dessert. It's so healthy, that you can even enjoy it as a breakfast treat. Cold butter is important because it contributes to a lighter, flakier crust. Once the bits of butter melt in the oven, they'll create delicious little steam pockets! Magic. But this only happens if it melts while in the oven, and not before it. So try to keep the dough as cool as possible before it hits the oven. In other words: mix the dough only until it starts to come together (no further), and roll it out pretty quickly. I like to keep my crust fairly free-form, and don't get too finicky about making it look perfect. I refer to it as "rustic-chic" and call it a day. Serve this dish warm, right out of the oven. For extra indulgence, you can add a scoop of vanilla ice-cream (or dairy-free alternative). Enjoy! Combine oats and salt in a food processor. Process until oats are the consistency of a fine flour. Add butter and pulse until the butter is cut into small pieces. Pour in 3 tablespoons of cold water to the dry mixture. Pulse until the dough starts to come together. Add just enough water as is necessary (up to 1 extra tablespoon). The dough should stick together when pinched between your fingers. Transfer the dough onto a piece of parchment paper. Use your hands to bring the dough together into a ball. Pat the dough down. Place a second piece of parchment on top of the dough. Use a rolling pin to roll out a thin layer of dough. Aim for a rough oval shape, about 1/4" thick. Remove the top layer of parchment paper. Generously pile berries into the center of the dough, leaving a 2" border around the edges for folding. Fold the edges of dough over itself to keep the berries tucked inside. Slide the tart and the bottom piece of parchment paper onto a baking sheet. 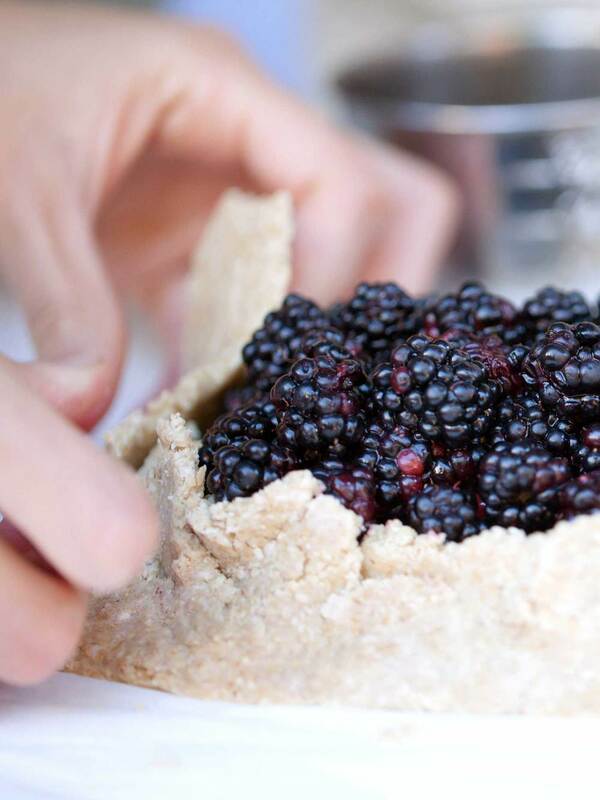 To prevent the berries from getting dried out during the baking process, cover the exposed berry center with a small piece of tinfoil (avoid covering the crust). Bake for 30 minutes (berries covered), then remove the tinfoil cover. Drizzle honey on top of the berries, then bake uncovered for another 15-20 minutes. Remove when the crust is lightly browned on the edges. Serve warm with extra honey for drizzling. -*Blackberries recommended, but you may substitute with other berries instead (e.g. blueberries). -If your dough feels sticky while rolling, use a bit of flour in between the dough and parchment paper. Rice flour or a gluten free all-purpose flour blend would work.